Demey R (compiler). 2014. Recent reports. Bulletin of the African Bird Club 21(2):239-252. Several flocks of Village Weavers were seen along Nile at Karima, in Sudan, on 19-20 April 2014 by Tom Jenner (purple marker). 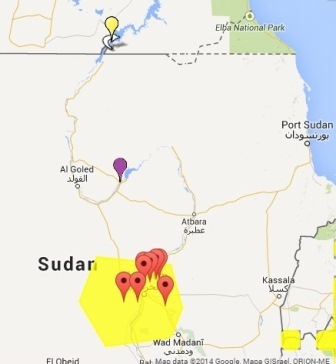 This is a range extension northwards by nearly 400km from Khartoum, from where there are many breeding records (red markers). There are records of Village Weaver in Egypt, even further north of its normal range (see news). For a species account and map of the Village Weaver see species text.